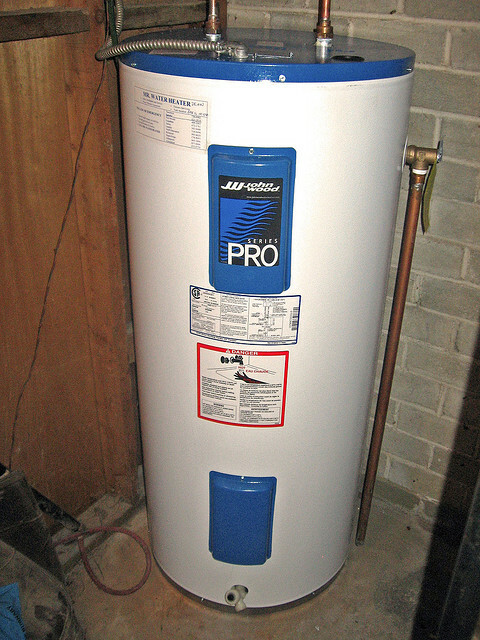 Your hot water tank represents one of the biggest opportunities for both money and water savings in your home. Literally every gallon of warm or hot water you use throughout your home will pass through it at some point and as a result your unit will require periodic maintenance. Fortunately, maintaining your hot water tank is a straight forward task and one of the best ways to maintain it is to periodically flush the sediment that builds up at the bottom of your tank. As cold water enters into your hot water tank it brings with it sediment and other particles that eventually pool at the bottom of your tank. This pooling of sediment, overtime, will cause your hot water tank to become less energy efficient and thus cost you more to operate. 1. Turn off the power to the hot water tank. Be sure that the power to your hot water tank is turned off before doing any work on your unit. Simply locate your circuit breaker and flip the switch controlling the hot water tank to the off position, or, if your tank is heated with gas, make sure to turn off the gas valve going to the tank. There are two reasons for doing this; one being that water and electricity don’t mix and it’s a way to ensure that the task is performed safely. The other reason is that unless your hot water tank is on a timer, the heating elements in your tank will continue to try and heat water even if there isn’t any in the tank. If this happens the heating elements could burn out. 2. Close the cold water flow valve. In order to be sure that you’ve flushed all (or most) of the sediment from your tank it’s important that you don’t continue adding water while it’s draining. Be sure that the cold water flow valve is in the off position. 3. Turn on the water in one of your faucets. Simply turn on the hot or cold water in either your kitchen or bathroom sink. This will prevent a vacuum from forming in the plumbing system and allow your tank to drain properly. A small trickle is fine…no need to run the faucet on high. 4. Attach a hose to the hot water tank’s drain valve and run it to a drain or bucket. Just about any typical garden hose should work, simply screw the female end of the hose onto the male end of your hot water tanks drain valve (remember it’s righty-tighty, lefty-loosey) and guide the end of the hose to either a bucket or drain. 5. Open the drain valve and let the water drain out. Depending on the type of drain valve you have you might be able to turn it by hand, or you might need to use a flathead screw driver. In either case, turn the valve to the left (counter-clockwise) to open the valve. You should start to see water flowing through the hose and into either the drain or bucket you have set up. When the water begins to drain from your hot water tank it should be hot (so be careful where you drain it!) and appear cloudy, the goal is to drain enough water from the tank so that it comes out clear. Accumulated debris and condensated gunk may come out in bits and pieces when you first start to clear the drain…that’s normal and ok, and exactly what you want to get out of your tank. After a few seconds or more, you’ll likely stop seeing particulate matter come out in the draining water–that’s a sign that you’ve gotten most or all of it. If you’re draining the water into a bucket you’ll likely have to empty the bucket several times in order to drain out a majority of the sediment (you’ll need to empty at least 1/3rd of the tank). When the bucket is full, take it outside or pour it into a bathtub. Just be sure that you don’t leave the valve on the hot water tank open while you’re emptying the bucket. 6. Close the valve and detach the hose. Once the water begins to come out clear you’ve likely cleared enough of the sediment from your tank to help it run more efficiently. Simply close the valve on the hot water tank, dump out your water and detach the hose from the drain valve. CAVEAT! If the water heater drain valve is plastic, there should be a gasket ring above the threads that acts as a final seal. Occasionally, this gasket will twist out of place when the drain valve is turned. Before closing the valve, look at the threads and make sure the gasket is above the threads. If it is twisted onto the threads, use the tip of a flathead screwdriver to pry it back up above the threads to ensure proper sealing. If you skip this step, the drain will not close fully and you will continue to have a small leak. 7. Turn off the water running from your faucets. Now that you’ve flushed the tank, you can turn off the faucet. 8. Re-open the cold water flow valve. This will start the process of refilling your hot water tank with water. Simply open the valve and your system will take care of the rest. 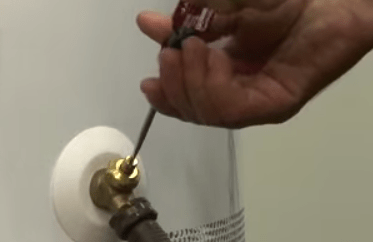 However, be sure that the cold water valve is open before returning power to the hot water tank, as we outlined above, you don’t want to heating elements to be running with nothing to heat because it could cause them to burn out. 9. Turn power for the hot water tank back on. Now that your tank is flushed and filling with water you can turn the power back on. Simply reverse whatever you did to turn the power off to the tank earlier. It’s important to note that it will likely take your hot water tank a couple of hours to produce enough hot water for showers and other actives around your home, so don’t be alarmed if the water coming from your faucets isn’t hot right away.